About the Children's Department: Thank Your Volunteers - With Apple Pie! Thank Your Volunteers - With Apple Pie! enjoyed learning karate, memorizing the fifth chapter of James and doing service projects this year (he just was awarded his yellow belt this past Wednesday!) So, last week I asked him if he would like to give something to his teachers to thank them for being his teachers this past year. He said, "I made them ornaments at Christmas (melted snowmen ornaments - really cool! ), so I think I should make something for them now." As I started to think about a craft he might make for them, he said; "I think I should make apple pies for them!" I have to admit I had not ever even considered making apple pies, but since it was what he wanted to give, I bought 18 mini pie tins so Josiah and his brother Caleb (who goes to the 2 year old's class) could make pies for their teachers. This past Wednesday the boys and I made all 18 pies and took them to church to give their teachers; I have never seen such happy, joy-filled smiles on my sweet grandsons' faces as when they gave their teachers the pies and told them how they helped to make the pies! I also have to say, the teachers had extremely happy faces as they received the pies too! Josiah's idea for making pies was a huge "hit", so if you are looking for an idea for something which you could give the teachers at your church, consider making mini apple pies! 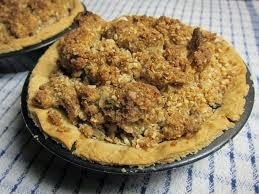 You could make them yourself, or ask non-teachers in your church to make six pies each which they can donate for the teachers - give them all a recipe (see the one I used below), mini pie tins and a date to deliver their finished pies to the church so they can be handed out to the teachers . . . get ready for extremely happy teachers! What has been one of your most successful teacher appreciation ideas? Mix ingredients, press into pie pans, fill with apples, top with crumble top and bake for approximately 45 minutes at 325 degrees. Enjoy!